Sister Kathleen Patricia McDonagh, O.S.F. 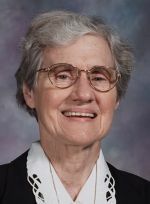 Sister Kathleen Patricia McDonagh, O.S.F., formerly Sister Etheldreda, died April 3 in Assisi House, Aston. She was 79 years old and had been a professed member of the Sisters of St. Francis of Philadelphia for 60 years. Sister Kathleen was born in County Galway, Ireland. She entered the congregation in 1951 and professed her first vows in 1954. Her sister, Sister Mary Philomena McDonagh, also entered the congregation and is also deceased. Sister Kathleen ministered in domestic work, child care, elder care and parish ministry. She ministered for 30 years at St. Cecilia Parish (formerly St. Gertrude Parish), Lebanon, Pa., in the Diocese of Harrisburg. From 1957-1958 she engaged in domestic work in the parish convent. She returned in 1977 and worked in parish ministry until 2007. She also ministered for 13 years in the Diocese of Trenton. She worked at St. Rose of Lima Convent in Freehold (1954-1955) and St. Joseph Convent in Raritan (1955-1957). From 1963-1969 and again from 1970-1973, she worked in child care at St. Michael Orphanage in Hopewell, N.J. She also cared for the elderly at Morris Hall in Lawrenceville, N.J., from 1969-1970. Sister Kathleen’s ministry in the Archdiocese of Boston included serving in domestic work at Holy Trinity Convent in Boston (1958-1961) and Our Lady of the Assumption Convent in Lynnfield (1961-1962). Additional ministry in the New England area included caring for the children in St. Mary’s Home in New Bedford in the Diocese of Fall River (1973-1977). In 2007 Sister Kathleen moved to Aston, where she served as a volunteer at Assisi House, the congregation’s retirement residence until her death. All services will be held in Assisi House, 610 Red Hill Road, Aston, on Tuesday, April 8. A Christian wake service will be held at 9:30 a.m. followed by a viewing. The funeral Mass will be at 11 a.m. Burial will be in Our Lady of Angels Cemetery in Aston. Sister Kathleen is survived by her sister, Nora Higgins; a brother, Michael McDonagh; nieces and nephews; and her Franciscan family. Donations in her name can be made to the Sisters of St. Francis Foundation, 609 S. Convent Road, Aston, PA 19014.